If you are currently looking for the perfect companion at home then there are plenty of reasons for getting a Cockapoo. Just ask anyone who already lives with one and expects to hear them gushing about how amazing these dogs are. What it is that makes them so great, though? 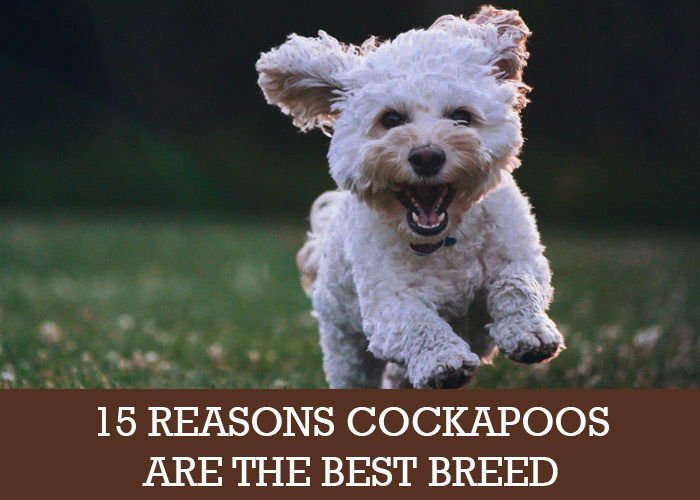 Well, the following are 15 of the very best reasons why Cockapoos are the best breed. People are also that crazy about them that there are tons of cool Cockapoo T-Shirts with slogans saying how they are the best dog. Yes, we know that you really shouldn’t decide what dog to take based on his looks. But seriously, these dudes are so cute that you just won’t be able to resist. The mixture between Cocker Spaniel and Poodle that they contain gives them an irresistibly adorable look. The good news is that the good looks they have as puppies don’t just disappear as they grow up. They also come in all different sizes and colours, so finding your perfect match is easy. Some look more like Poodles while in other cases their Cocker Spaniel heritage shines through more brightly. When looking for a cute new puppy you are likely to see Cockapoos with a variety of types of coat too. All in all, finding the perfect match for your needs and taste isn’t going to be difficult, although don’t be surprised if you fall in love with a dog that is completely different from what you had in mind. There is nothing that a Cockapoo loves more than to spend time with their family. This makes one perfect if you want to have a loyal companion who never gets bored of being around you. They also enjoy making new friends, whether they are people or animals. When you see the joy on his face as he goes to the door to welcome you home then you will realise that this is the perfect dog breed for you. You may sometimes see Cockapoos described as being hypoallergenic dogs. While this isn’t completely true, they are much more suitable than most breeds for someone who is allergic to dogs. This is because they don’t shed very much, meaning that the dead skin cells that cause allergies don’t come into contact with the people they live with. If other dogs cause nasty reactions for someone in the house than a cool Cockapoo could be the solution. With some breeds of dog, you need to give them an awful lot of exercise every day. Thankfully, Cockapoos aren’t so demanding when it comes to getting out and about. You certainly don’t need to organise an exercise regime that would leave an Olympic champion gasping. This makes them perfect for someone who doesn’t have the time or energy to take them out all the time, and they can live in an apartment easily enough too. However, we still recommend you get the dogs out twice a day! Maybe one off the lead on a park so that they can burn off some of that energy before bed time. Despite the last point, you don’t need to worry about your new puppy being lazy. These friendly little fellows love to play and will run or swim as much as you let them. In this respect, they are brilliant dogs for an active family with children who just want to have lots of fun. Your Cockapoo will never get tired of playing or having a good time. This breed is one type of dog that doesn’t have a particularly strong smell. While some pooches give off a powerful odour pretty much all the time, your Cockapoo will normally be free of bad smells. Of course, the exception is when he gets up to some mischief out in the park or garden and comes home in need of a good bath. Cockapoos are generally regarded as being fairly easy to train. This is said to come from the Poodle part of their background making them smarter than the average pooch. You should see clear signs of your new dog’s intelligence early on. This is great news, as it is going to make it a whole lot easier to train him quickly and effectively. Cockapoos are wildly popular in the UK so check your local rescue centre for Cockapoos. There are thousands of these wonderful dogs out there, so you can take your time and find the ideal companion for your family. The fact that there are so many dogs of this type around also means that it is a simple matter to find some company for him. Just go to the local park and there is a very good chance that he finds a new Cockapoo friend right away. One of the main reasons why so many people choose an adorable Cockapoo is as a friend for their children. These lovable pooches are fantastic with children. You could very well find that they soon spend most of their time together, playing and having fun. The mutual friendship between a youngster and a Cockapoo is something that is quite wonderful to see. If you have another dog at home then you should find that the two of them soon become the best of friends. While a Cockapoo’s exuberance might take other dogs time to get used to, his laid-back attitude and sense of fun will soon win over another new friend. Cockapoos also tend to get on well with cats and other types of animals as well such as cats and rabbits. They love socialising so you should definitely look to give him plenty of opportunities to make friends. Not every Cockapoo has the same type of hair, as some will have tighter, Poodle-like curls than others. However, the one thing that they all have in common is a coat that makes them perfect for cuddling up to bed. Lots of soft, lovely fur makes it a great idea to cuddle or stroke your puppy at any time. Just remember to groom him regularly in order to keep his coat looking as good and as healthy as it should be. Do you want a faithful companion to stay by your side at all times? In that case, a Cockapoo is going to be absolutely perfect for you. These little dogs simply love being with their family and will keep you company all day long. They enjoy nothing more than being by the side of the people they live with. This makes this breed ideal for someone who is perhaps home alone a lot of the time and wants reliable, fun company. It is normal to feel a little wary of bringing a new dog home with you, especially if you have kids around. Although some breeds of dog can be unpredictable or dangerous, a sweet Cockapoo will simply add joy and fun to your home. These are safe dogs who just want to have a good time and be close to their family. Due to their massive popularity, you will find that there are lots of good breeders to choose from in the UK. This means that you can stay away from dodgy breeders and choose your puppy from someone you can trust. In this way, you can feel confident that you will get a healthy dog who will go on to be a fantastic companion for years to come.